Fife Flyers are preparing for a pivotal weekend in their season as they clash with fierce rivals Glasgow Clan in a crucial double-header. Flyers travel to Braehead Arena on Friday before welcoming Pete Russell’s side to Fife Ice Arena on Saturday – two massive games that will have a significant bearing on the Gardiner Conference title race, as well as the push for play-offs. Three consecutive defeats have resulted in Flyers dropping to fifth in the EIHL standings, and into a dogfight for a play-off spot, with just five points between the Kirkcaldy side and 10th place, surprisingly occupied by big guns Sheffield Steelers. Clan, on the other hand, are one of the form teams in the EIHL, and after leap-frogged Fife into fourth place at the weekend, they will be keen to stay there. With Flyers also playing catch-up in their bid to retain their conference title, head coach Todd Dutiaume is in no doubt over the importance of this weekend’s matches. “This is a defining weekend for us,” he told the Press. “Clan are one of the hottest teams in UK right now, and their recent record certainly reflects that. They seem to have that momentum, and we need to stop it. Last Sunday’s home match against Cardiff Devils was postponed due to ferry cancellations which left Fife stranded in Belfast where they fell to back-to-back defeats on Friday and Saturday. 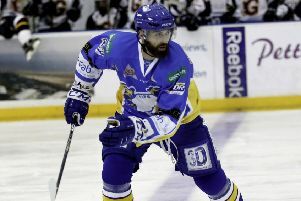 Flyers did not arrive back in Kirkcaldy until 10.00 pm – almost four hours after the scheduled face-off time. “Those two games in Belfast certainly took their toll,” Dutiaume said. “They were high-paced and tough. “To come back and play the league leaders and get a result would have been a tough ask. Flyers current form is a point of frustration for Dutiaume, who believes individual errors, rather than poor team performances, are the difference between winning and losing games. “It’s easy for people to say there’s no plan B, or it’s the same old Flyers, but that’s not the case,” he said. “We change things all the time. Week to week and in games. We have a number of tactical things, and we believe strongly in our systems. We’ve been very successful with them, and we’re always constantly looking to update them. “It is 100 per cent mismanagement of the puck – plain and simple. Where I feel bad for this group, is that a lot of them seem to get placed in the same category on a loss, but Saturday’s game was the difference between one turnover. That ‘s happened an incredible amount, and not just to us. One of the options open to Dutiaume is to bring in replacements for his underperformers, but he admitted that the transfer market has so far proved unfavourable. “The market is dead,” he said. “There is no sense in making an incredibly expensive change for this club when it’s not going to make us better. “It needs to make us better, and send the right message. “You see some teams have been fortunate, and we’ve been in talks with some guys and lost them to other teams, but it’s not as open as it was two years ago.